When you decide you want to carry a firearm there is one piece of equipment that is vital but often over looked – the holster. 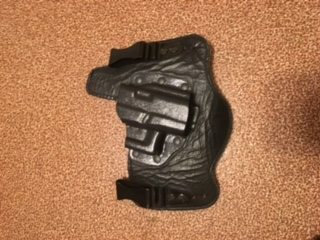 Many new CCW holders look at the holster as simply a piece of nylon or leather that holds the firearm- kind of like a cup holder. But your holster is far more than that. Selecting the correct holster will not only allow you to carry a firearm it will allow you to do so in a safe, functional manner. Select the wrong holster and you might as well leave it at home and just tuck you gun in your belt. When selecting a holster, it is important that you choose one which will allow you to carry your firearm securely, that you be able to access the firearm readily when needed, draw the firearm without difficulty and reholster that firearm when necessary. But selecting that perfect holster can be confusing even for an experienced firearms owner. Trust me, ask anyone serious about handguns and they will tell you they have a drawer full of models they do not use. This is called learning by trial and error, what you want to do is learn from other’s mistakes and avoid having your own junk holster drawer. Select a holster designed for your specific firearm. Many holsters are generic in design and will fit a wide range of firearms based on whether a revolver or a semiautomatic and barrel length. Although these holsters are generally cheaper than firearm specific models you get what you pay for. 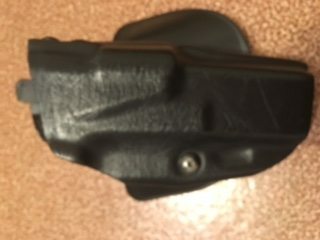 Even the best quality generic holster does not fit as well as the others which will eventually result in a lower level of retention and security. Avoid bulky, hard to hide models. Yes, l arge outside the pants holsters can be used for concealed carry but they require bulky, loose clothing to properly hide. 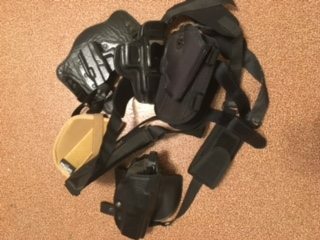 If you plan on getting multiple holsters for use with different clothing and in different weather conditions these a quality outside the pants holster is a worthwhile investment. However, if you are looking to get one single holster you can use in multiple situations look for a model more easily concealed. Any holster you select must be comfortable. This should be obvious but if the holster you select is not comfortable you will not wear it and it will be the beginning of your very own junk drawer. You should try on various models and see how they fit with your style of dress and body type before making a final selection. Make sure you can reach it, sit with it and whether you think you will be able to wear it for extended periods. Security is important. As stated before, one of the reasons for a quality holster designed for your specific firearm is the level of security and retention it will provide. First, look for a design that provides protection from accidental loss. A retention strap or internal lock is a must for concealed carry otherwise you risk you gun falling out when you bend over at the grocery store or when you adjust your jacket. Second, I prefer designs that include full trigger coverage. While many experienced shooters will opt for more open designs concealed carry users should avoid this approach. Third, make sure that the material is rigid enough to hold is shape without impeding with the firearm safety. Many soft side holsters will become misshapen when the firearm is removed, allowing the material to hinder reholstering or even interfere with operation. More than one user has found themselves facing an accidental discharge due to the holster catching on the safety or trigger with holstering. Where you carry your holster will be as important as what you carry it in. Most concealed carry users choose to carry their firearm on the hip, small of the back or in an appendix position however there are other options. There are many quality holsters designed to allow carrying in other locations including the ankle, pocket or under the arm (shoulder holster), however, these are not for everyone. It is important that you be able to access the firearm when needed and that you be proficient with drawing it smoothly when doing so. If you decide to carry in one of these not traditional locations it is important to practice using it and remember there are times when doing so may not be practical. Bottom line do not skimp on your holster. It is tempting to select the cheapest holster, especially if you just spent a good deal of your savings on the firearm itself. However, the money you save many only be a short-term savings. If the cheaper holster is not well made it is likely to fall apart far sooner than expected. If it does not fit properly you may drop your firearm and spend that savings on repairs. If it is not comfortable you will ditch it for a different model and spend more in the long run. Although price is not the only indicator of quality it is a factor you need to consider. Spend as much as you are comfortable spending in order to get the right holster for you and your situation. As I stated earlier selecting the perfect holster, if such an animal exists, if often more difficult that buying the firearm it will be protecting. But it is a necessary accessory if you plan on taking that firearm out of the house. Although this list is not a complete, all encompassing buyer’s guide to holsters it should be enough to get you started. As you begin carrying your firearm every day you may find your needs change and so do your preferences. If this is why you select a new holster down the road then so be it, you are evolving as a firearm user. At least you will be moving in a positive direction and not learning by trial and error.